When R. Neville Johnston was shot three times in 1977, he died. But he came back knowing some things he hadn't known before. That the universe is made of up of vibrations for one. And that some of the most meaningful vibrations are the words we use in everyday thought and speech. Obviously it behooves us to choose our words with care so we can create the life we want. 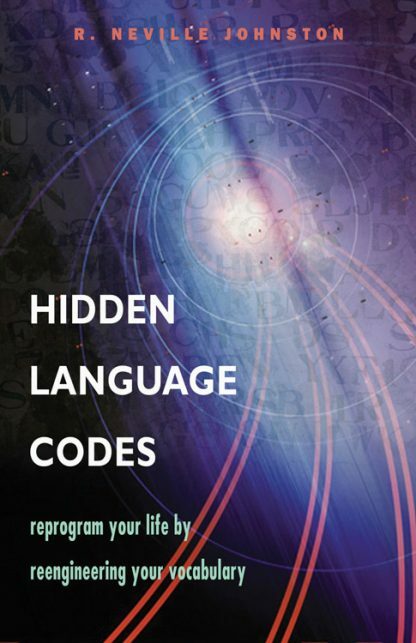 Hidden Language Codes is a book about thought. Where we go in life is directly related to our mastery and command of our thoughts and our language. In evolving, we naturally change the way we think. A method of accelerating this process is to change the very words we think with. This book is the key to learning words that will improve our lives and giving up the ones that hold us back. Learn to use power words--words that serve us well--such as "acceptance," "faith," even "MacGyver," and the key power word, "love." Those words that do not serve us well include "greed," "blame," "hard," and the poster child for disempowerment/slave thinking "can't." Our language is full of unconscious triggers--the words we speak are making decisions for us, running us. As long as we continue to try, need, guess, want, whine, and victim our way through life, we sabotage our own goals and happiness. Never use these words again. Take charge of your thoughts and speech, and your life will follow suit. R. Neville Johnston was shot to death in 1977. He woke up in a hospital able to see people in their past lives. This NDE or "shaman's death" was just the beginning. He believes that he was sent back to assist in raising human consciousness to a higher echelon by helping us learn to speak an ascended language. He is the author of many books including The Language Codes and Telepathic Etiquette. Johnston lives in Reston, Virginia.